Appartement de 60 métres carrés avec 2 chambres ,au centre du village . ..This sunny apartment*** is located on one of the main streets of charming Ménerbes, located in the heart of the Luberon Valley, a close driving distance from Gordes, Roussillon, Lacoste and Oppède. The flat features a bright living room, spacious kitchen, library and a comfortable bedroom with en suite bathroom. The large, modern kitchen offers appliances such as a dishwasher, refrigerator, stove, coffee maker, electric tea kettle, toaster, etc. It also is well stocked with dishes, pots/pans and glasses. The bedroom features a comfortable queen-size bed and is attached to a large, updated bathroom with a sink, towel warmer and walk-in shower with a rain shower-style showerhead. The toilet is located with the washing machine in a separate room. The library off the living room is full of CDs, DVDs, adult and children’s books and a sofa that can become a single bed. All kitchen, bedroom and bath linens are provided. The WiFi is strong-- as is the heat if you visit during the cool months. The apartment’s front door is a private entrance off of an alley staircase; and there is another short staircase from the front door to the living area. This flat is a short stroll from Ménerbes’ shops, restaurants and cafés. The Truffle Museum in upper Ménerbes offers tastings of the wines of Luberon plus a lovely garden where you can read a newspaper and sip a beverage. The Jane Eakin museum allows you to discover beautiful post-Impressionist paintings in a typical Provençal house. This village is also within easy driving distances of the Alpilles, including Les Baux and Saint Rémy. Isle sur la Sorgue is a lovely nearby city with canals and a huge, lively Sunday Provençal market that stretches over many streets. cet appartement est situe dans un tres beau village ,tres vivant et bien situe au coeur de Luberon (a moins de 10 km de Lacoste,Bonnieux ,Gordes ,Roussillon et Oppede), c'est un point de depart pour de nombreuses excursions . Aix en Provence et Avignon sont 2 villes toutes proches de Menerbes (une quarantaine de km ) vous pourrez assister aux festivals de ces 2 villes en ete ,a La Roque d'Antheron vous pourrez entendre du piano chaque soir . De nombreux artistes sejournent dans le Luberon et les expositions sont multiples . L'appartement est tres confortable ,agreable ;a deux pas vous avez des petits commerces , un marche tous les jeudis ,de nombreux restaurants et de jolies boutiques . Menerbes est situe entre L'isle sur la sorgue ( antiquaires et grand marche tous les dimanches) ,et Apt (grand marche tous les samedis matin ). Maison agréable et bien équipée. Je recommande. This is such a cozy little apartment in an 18th century building in the middle of one of the most charming villages in Provence. There's room for 2 adults and a child if you like, or use what would be the kid's room as an office overlooking the bustling street below. There are two excellent restaurants just up the street, and a boulangerie just across the way. If you're a bicyclist, this is a cyclist's dream; enough hills to make it good exercise, enough flat that you can explore Provence for many kms on some of the world's best véloroutes an easy bike ride away. Most importantly, you will not find a kinder, more appreciative and accommodating landlord than Danièle Cohen. This is a risk-free rental, if ever there was one! Merci beaucoup David .Je vous souhaite de belles fêtes de Noël. On se sent tout de suite très bien dans cet appartement au centre de Menerbes. Très bonne literie, grande salle de bains, tout ce qu'il faut pour cuisiner. Salon très agréable. Daniele a pris soin de s'assurer que nous avions tout ce qu'il faut et que nous nous sentions bien. Ce séjour de 10 jours nous a permis de nous ressourcer dans ce magnifique village. Un vrai coup de coeur ! We had an excellent visit to Provence and this apartment was a wonderful base to explore the area. We stayed there for two weeks and we loved it. It is much bigger than it looks in the photos. We were 3 adults and there was enough space for all of us. The apartment is beautiful, as many have said, but we were particularly impressed with the first class appliances and the attention to detail that was taken with the construction and the decoration. 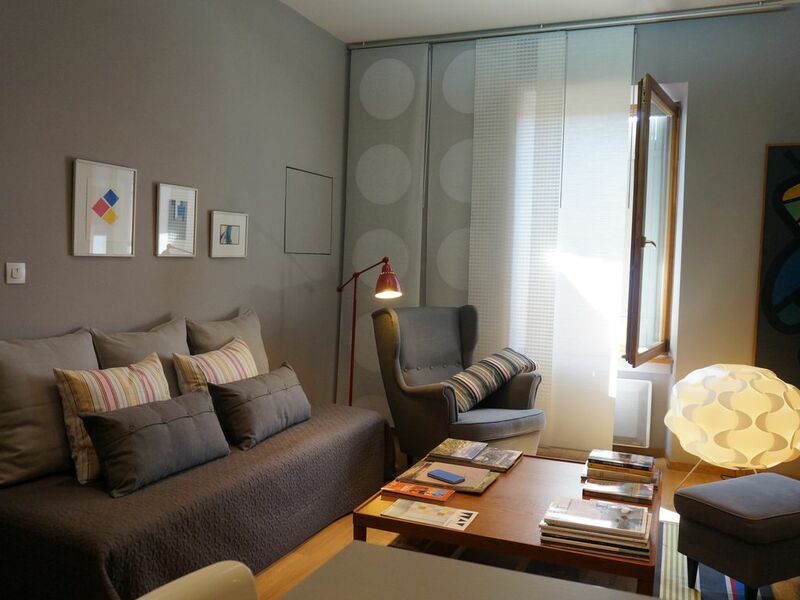 The apartment is excellently equipped, with original art works on the walls and super lighting in all the rooms. It is charming, spacious, very comfortable and spotlessly clean. The kitchen has everything you need, the bathroom is modern and spacy and everything is in perfect condition. The Wi-Fi is excellent and parking is not a problem. There is also a nice boullangerie few steps away, several restaurants, grocery shop and gelateria just round the corner. Menerbes is a lovely little town, ideally located for exploring the Luberon area, as well as Avignon, Aix en Provence and other interesting places. The owner, Daniele, always responded to emails quickly and arrangements were simple and straightforward. Although we did not meet in person, the contact with Daniele was very pleasant. All the information and directions she provided for our arrival were clear and detailed. We also had lovely bottles of wine in the fridge to start our holiday. Merci beaucoup Daniele, it was a real pleasure to stay in such a beautiful and interesting place! J'espère que vous avez apprécié votre séjour dans ma location. Je souhaiterais vous inviter à partager votre avis sur votre séjour. Pour donner votre appréciation, il vous suffit de cliquer sur le lien "Rédigez votre appréciation sur vos vacances". J'espère sincèrement vous accueillir de nouveau durant l'un de vos futurs séjours. My wife and I spent a lovely week in Daniele's apartment in Menerbes. We love the way that the old and new are juxtaposed...it was very comfortable and beautifully appointed. A true home away from home. Nicely located in the center of the village. We will definitely be back. decouverte des villages du Luberon et des marchés de Provence;ballades en vélo (piste cyclabe de Cavaillon a Apt )et pour les plus aguerris ,l'ascencion du mythique Mont Ventoux . les Alpilles (les Baux de provence )sont a 40mn de Menerbes . festivals:Avignon, Aix ,La Roque d'Antheron . 50 euros supplémentaires de chauffage du 01/10 au 15/03 Pour des séjours de plus de 3 semaines les frais de ménage s'élèvent a 120 euros. le linge de maison est changé toutes les semaines.